October 9, 2012, Keelung, Taiwan - Lian-Li Industrial Co., Ltd, today announces the massive brushed aluminum HPTX supported chassis – PC-D8000. Able to hold up to twenty 3.5” hard drives, two power supplies and one of the largest motherboard form factors on the market, the PC-D8000 has plenty of space to fit all the hardware an enthusiast desires. 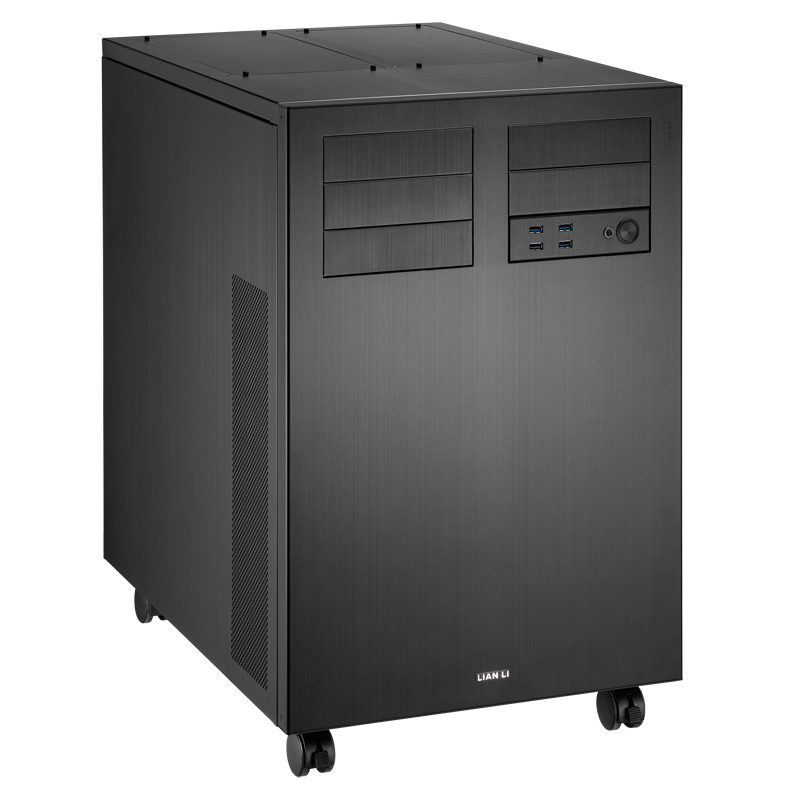 The massive 405mm x 628mm x 572mm (15.9” x 24.7” x 22.5”) PC-D8000 complements the virtually limitless hardware and storage capabilities with many tool-less features for ease of installation. The front panel of the PC-D8000 pops-off allowing full access to the twenty 3.5” hard drives. Each drive can be easily secured and removed thanks to the included thumbscrews and rubber suspensions. A key lock for the 3.5” HDD cage preventing unwanted removal of the hard drives adds extra security. The tool-less design of the five 5.25” bays make it easy to install optical drives. Unused 5.25” bays can house two 2.5” HDDs or SSDs each for a total of ten 2.5” maximum. The motherboard tray which can support HPTX, EATX, ATX, and Micro-ATX motherboards is removable giving unhampered freedom to builders when setting up their system. The motherboard tray also features large cutouts for the CPU and rubber grommets for neat cable management. CPU coolers up to 160mm easily fit inside the case. Up to six 140mm fans are supported behind the front panel. The rear of the chassis has one 120mm fan included with space for three more 140mm fans. Additionally, for builders interested in water cooling, the D8000-1 fan guard is specially designed to aid their water cooling builds. The Lian Li PC-D8000 has vented eleven expansions slots with thumb screws. Expansion cards up to 410mm (16.1”) in length are supported. The PC-D8000 supports dual power supply setups. Two power supplies up to 360mm in length fit easily in the rear of the chassis. Underneath the PSUs ventilation slits with removable pull-out filters help increase the life and performance of the power supplies. This massive Lian Li chassis sits on four roller wheels, so no matter how much hardware is put inside, transportation of the PC-D8000 is never a problem. 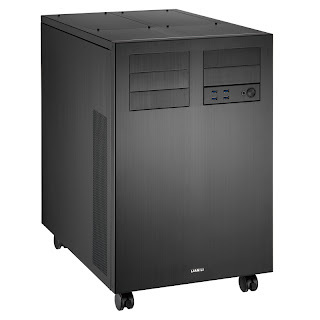 The Lian Li PC-D8000 will be available for the suggested retail price of US$349. To celebrate the growth of its new Facebook page Lian Li will be giving out a free PC-A75X once it reaches 5000 Likes. Like the page and fill out the form for a chance to win a PC-A75X.